How would you have answered this question? Does paper top your list? Kid stuff like papers, shoes, backpacks and jackets? Craft supplies? If so you’re in good company, and you’re in the right spot! For the next few days, right here on the blog, I’ll be sharing simple organizing ideas to tackle your biggest clutter hotspots. And with back to school just around the corner, the timing couldn’t be better. Clutter adds a layer of stress to our homes and lives, which is the last thing we need during the busy school year. So put an idea or two into action before the school bell rings for the first time this year! Here are simple solutions to your most common clutter hotspots. Then, be sure to come back to my blog throughout the next week for more clutter-busting ideas. Collection system. Also known as an in-box, your collection system is the spot for incoming mail, papers from school (completed work, forms to sign and return, event notices, artwork, etc. ), and any other paper that has made its way into your home. Once a day go through your in-box and sign those forms that need to go back to school, file away (or recycle) completed assignments and art projects, and record upcoming events in your planner. Art and schoolwork incubator. This is the spot to temporarily put completed school papers. Your incubator allows you to keep completed projects separated from items that have an action associated with them, and they allow you to delay your decision about what to keep and what to recycle. While normally I don’t advocate delaying decisions (as this can be a huge source of clutter) when it comes to kids’ artwork and schoolwork, the delay can serve a very beneficial purpose. The delay allows you to accumulate more papers and artwork, which helps you see which items are the most special and the most worth keeping long term. Home management binder. 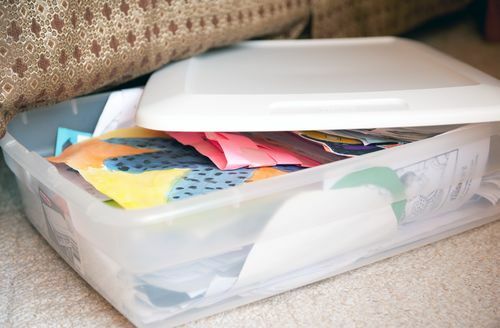 If you aren’t using a home management binder yet, check out my free online class How to Create a Command Central Binder. Hands down, this system has been the hugest help in eliminating paper clutter in my home. It helps you get all of those papers you refer to all the time (lunch menus, schedules, organizing printables, etc.) off your counter or refrigerator, and tucked away in a neat and tidy system. It’s a lifesaver! Action system. My last essential paper system for back to school is an action system. This is simply a place to organize and store paperwork that needs your (or your child’s) attention sometime in the future. These action papers, like ongoing homework assignments, reading logs, and community service logs, could be stored in a file box or basket on your counter top. 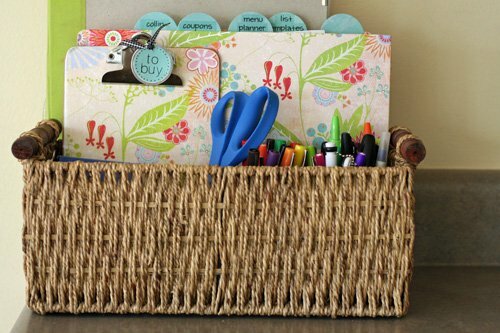 Or you could use a magnetic board, bulletin board, or clipboard hung above your child’s desk. (These are great solutions if you or your kiddos are visual, and needs to see papers to remember to do something with them.) The key is to store your action papers close to where the action (homework, paperwork, planning and scheduling) happens. 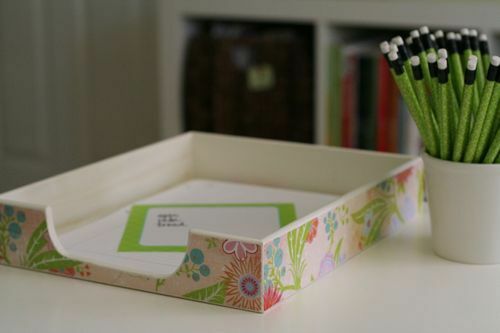 Alright friends, be sure to check back throughout the upcoming week for more clutter-busting ideas on my blog. See you there! Sometimes organizing gets easier! I put some of these systems in place after I took your paper clutter a few years ago. I was able to clean out my home management binder, art incubator (with the help of my kids) and refine my action system. Feels so good to be ready for school which starts next Wed (Boo Hoo!) Thank you for the help and inspiration! I’m so glad to hear that organizing has gotten easier in terms of your paper! So happy the systems you set up in Organize Your Paper Clutter are working well for you. Thanks for your comment! Enjoy the last few days of summer with your kiddos.